Unfortunately, a pumpkin spice latte doesn’t count as a meal. As college students, there never seems to be enough time in the day. Between school work and your social life, finding time for healthy dinner options can be a hassle. Ordering GrubHub every day is tempting, but not great for your wallet. As the fall season approaches, here are four quick and easy squash-inspired dishes to get you into the seasonal spirit, while keeping the calories to a minimum! It’s 6:30 PM and you’re just getting out of class. After a long day, all you want is a quick and easy meal. 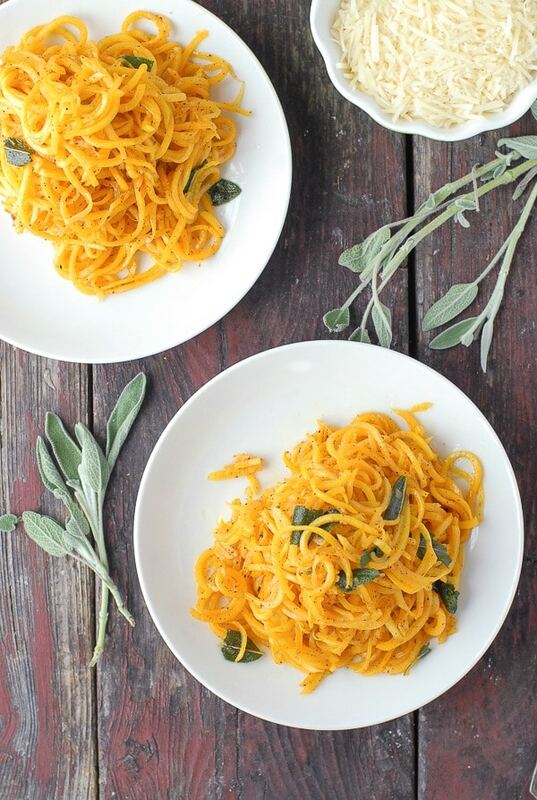 Luckily, all you need for this dish is spiralized butternut squash – which you can easily grab at your local Trader Joe’s or Wegmans. Combine it with sage, butter (or olive oil if you’re feeling healthy), salt and pepper for a healthy dinner that will leave you feeling full. First, pour some butter or olive oil into a pan with the stove at medium heat and add in the sage and let it soak up all the flavor. Once you smell the sage, you’ll know it is time to add the butternut squash spirals! From there, your meal is simply moments away. Heat the squash to your preference and enjoy! We’ve all been there. Date night is tomorrow and you’re looking for a filling, yet healthy meal that won’t break the bank. This is the perfect time to throw together a butternut squash and feta arugula salad. Either cut up a fourth of a butternut squash into small cubes or buy it pre-cut from your local supermarket. Next, cut up some yellow onions and throw the onions and the butternut squash on a baking tray. Pour some olive oil over the top, add salt and pepper and cook for 20 minutes! Mix in some arugula and feta and enjoy you’re perfect pre-date night meal! This week of tests has flooded your brain and making dinner is the least of your concerns. Your simple solution: Spaghetti squash. Spaghetti squash is a super delicious and low calorie version of spaghetti. With your sharpest knife and strongest roommate, cut the squash in half. Once it’s cut, scoop out the insides, pour olive oil on top, and finish it off with salt and pepper. Place it in the oven for 40 minutes at 400 degrees and relax – maybe even try out a new face mask. Take some time for yourself, you deserve it! Once the squash has cooked, take a fork and scrape out the spaghetti (it will easily come out) and add whichever pasta sauce, pesto or toppings you prefer. Bon appétit! You’re having a Friendsgiving and want to contribute, but don’t want to put too much effort into your dish. Butternut squash mac and cheese is the go-to choice! This dish is way easier than it sounds. Boil water and throw in whichever pasta of your choice. Brown rice and quinoa fusilli are great healthy options for this dish! In a separate pot over a medium to low heat, pour in half a cup of almond milk or regular milk. Next, pour half a can of butternut squash puree into the milk and add two cups of your preferred cheese like a shredded blend of cheddar, Monterey jack or mozzarella. As soon as everything is melted together, stir in the cooked pasta, pour it into a baking pan and sprinkle some extra cheese on top to finish. Add salt and pepper to taste. Cook this for 30 minutes at 350 degrees and your friends will be genuinely impressed. Make sure to let them know that it’s much healthier than regular mac and cheese too! Now you’re ready to tackle weeknight dinners with these easy squash recipes!